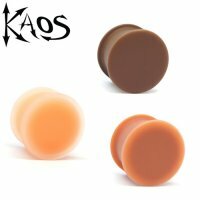 Kaos Hider Plugs 10 Gauge to 1"
Made by Kaos Software using implant grade silicone. 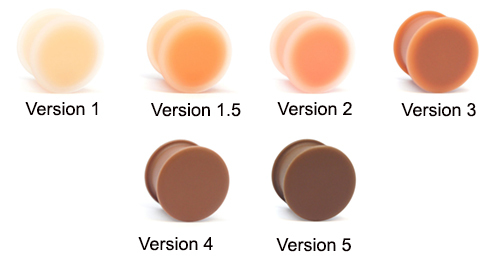 These Hider Plugs will not completely mask your piercing but will make it less obvious. The Hider Plugs have a matte solid front and a hollow back which allows for easy insertion. For the most accurate match, please compare the skin tone of your ear lobe as it tends to be a shade lighter than the rest of your skin. Note: This is for a single plug! If you want a pair you must order two. Select (2.5mm) 10gauge (3mm) 8gauge (4mm) 6gauge (5mm) 4gauge (6.5mm) 2gauge (8mm) 0gauge (9.5mm) 00gauge (11mm) 7/16" (12.5mm) 1/2" (14mm) 9/16" (16mm) 5/8" (19mm) 3/4" (22mm) 7/8" (25.5mm) 1"